Nate and I landed separately in Okinawa a decade ago in a complete accident of assignment, snorkeled a lot, but didn't dive until we returned in 2002. It took a year before we started diving and another before we incorporated the photography element. Since then, we've been in the water every opportunity and usually at least one of us is photographing. The trick is to get something worth photographing to swim in front of the lens and click the shutter at the right time. This was a site called Hanahige (mustache – no idea why) the first day of diving. 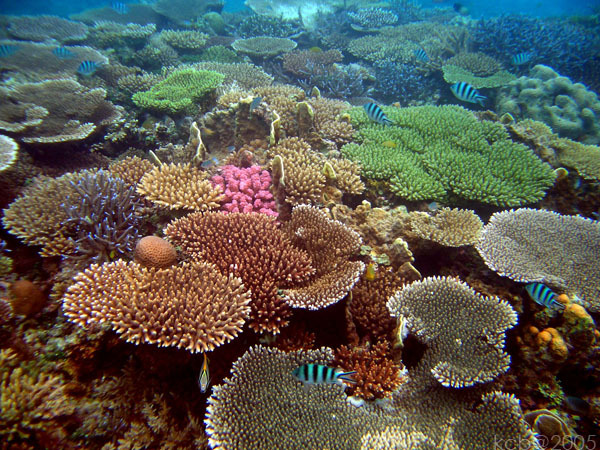 The site was islands of coral scattered throughout the white sand sea floor. 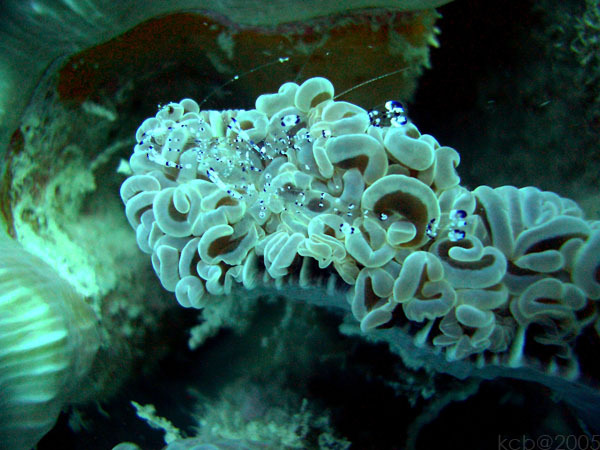 We saw a wide variety of corals and fish, a few eels (unagi) and nudibranchs (umi ushi). We also saw a large, incredibly beautiful tiger cowry. 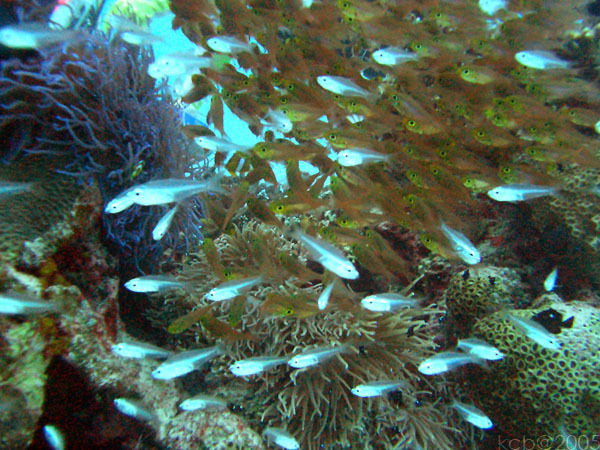 Large schools of fish congregated in areas. The sand gave the additional benefit of bouncing additional light for photos. This was also at Hanahige. 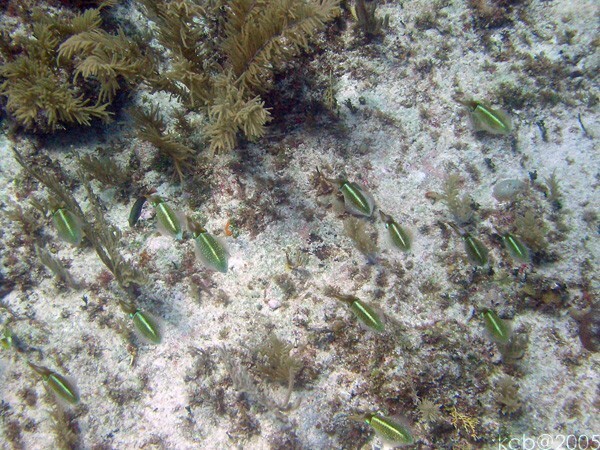 The green bird wrasse darted amongst the striped sergeants and popped inquisitively toward me every so often. I think they were expecting a handout. 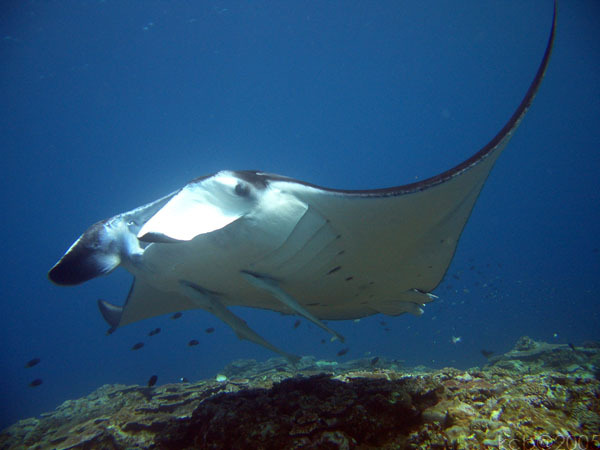 The second day we dove with mantas (iitomaki ei) as we would every other day. They would cruise up to us curiously singly or in groups up to three, then sheer off at the last minute. 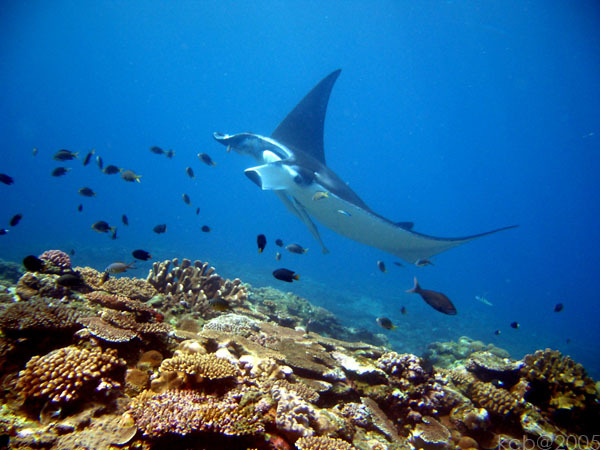 This site was the “Manta scramble” or “Manta sukuranburu” and even the one day the mantas didn’t show it was beautiful. 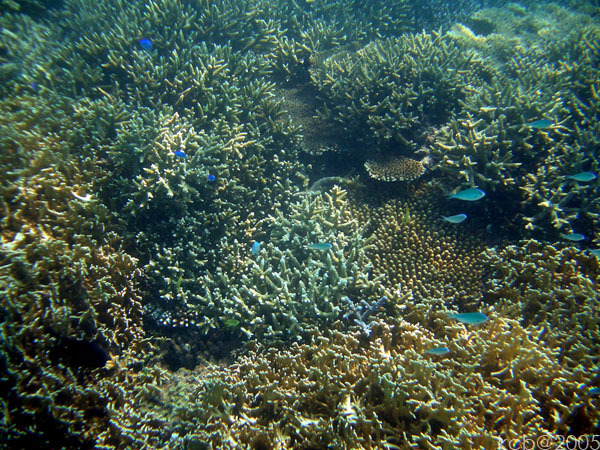 The corals were incredible and various schools of fish populated the area. We saw schools of smaller tuna (isomaguro) near the surface. 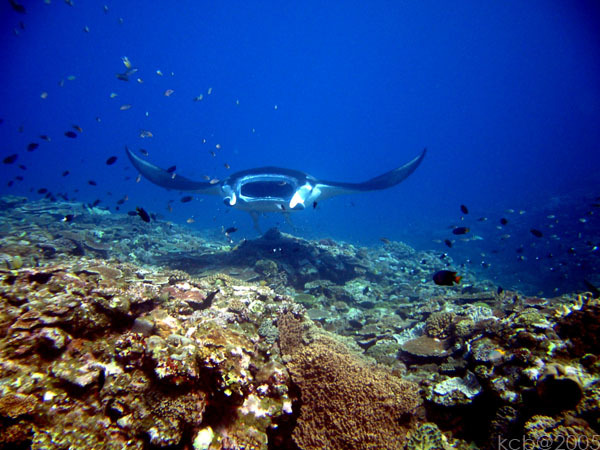 Here was one of the mantas turning on his run toward me. 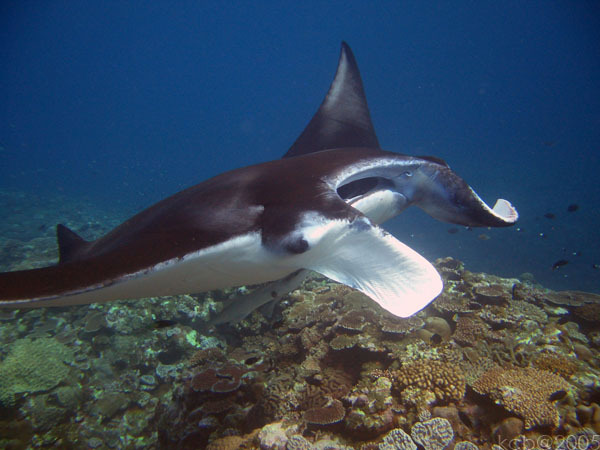 Again, you can see the big guy turning, recognizable with his remora ornamentation. This taken at Taketomi haitei onsen, of Taketomi hot spring. 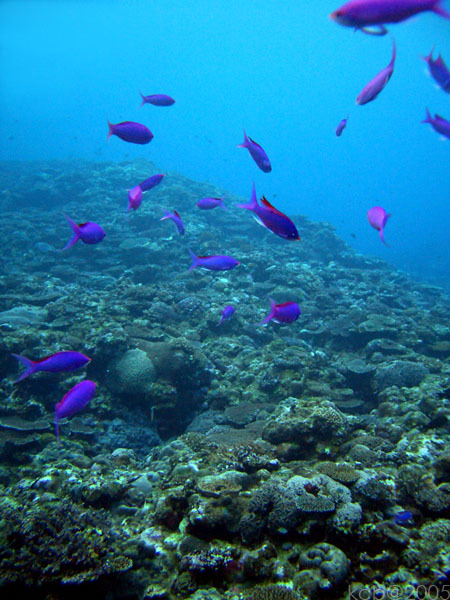 The intent of the dive was to bring us to a hot spring in the ocean floor. After we played with the hot, shimmering water for a few minutes, I found this shrimp (ebi) on its coral home. The next day we dove near Irimote Island at a site called Barasu (to expose a secret) and saw turtles (kame), rays (ie), huge moray eels and flatworms (hiramushi). 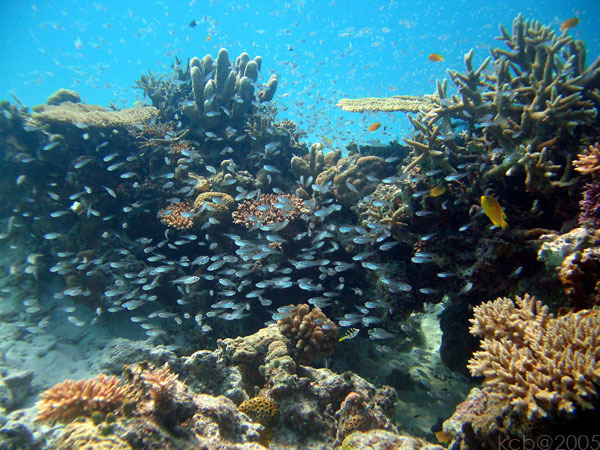 This photo was taken during the surface interval snorkel. 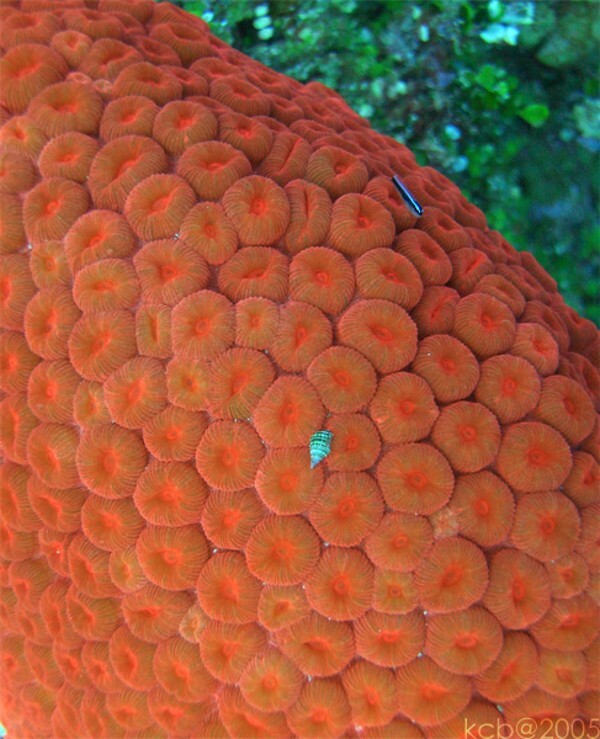 The color and variety of coral was wonderful. Same site near Irimote. 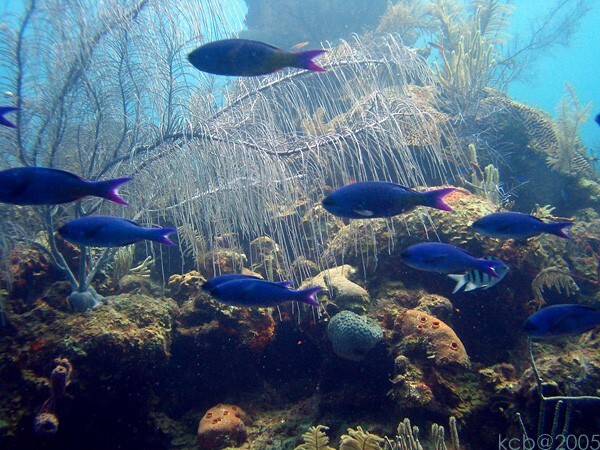 The chromis would dart into the sheltering coral if I became too close and then slowly drift out when they started to feel safer. Back at Manta scramble, I photographed these iridescent purple queens (hanagoi). They seem to enjoy the current, their schools forming arcs. It was rather wavy that day. This was also the Manta scramble. 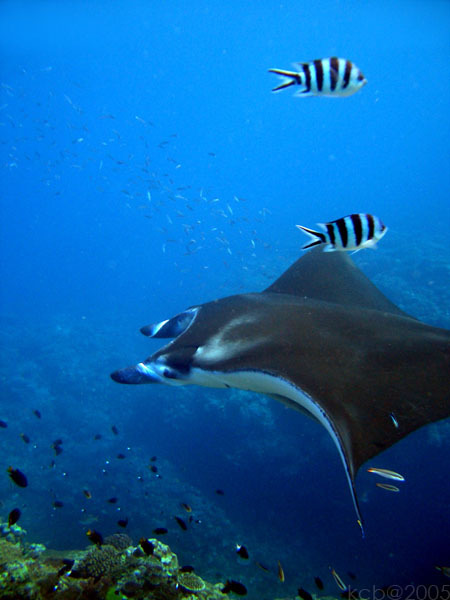 Several groups of mantas began circling the area and a number of divers had congregated around a coral head watching them. Mostly the mantas stayed on the other side of the bommie, so we only saw the occasional wing flaring out through the bubbles, but this group came right over us and gave us a good view. 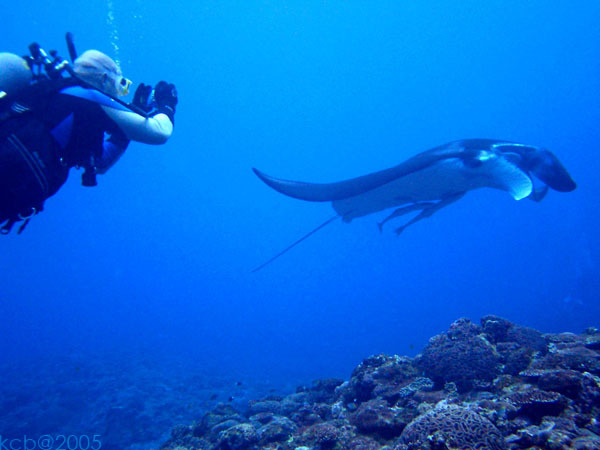 Imagine if you will a ring of bubbles from the 40-50 divers all entranced by the rays flying around. 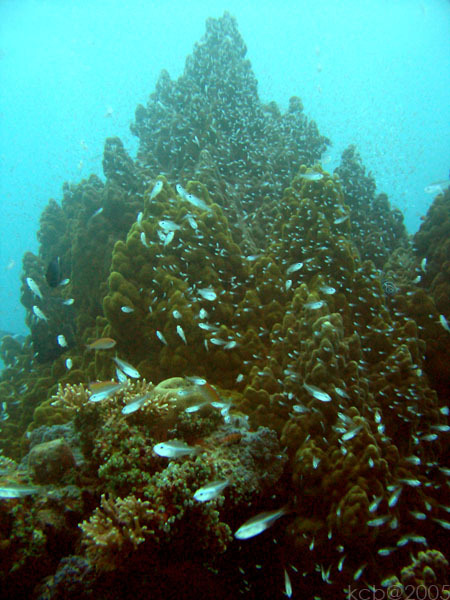 Osaka hanagoi riifu (Anthias reef) was a steeply sloping site with a series of bowl shapes deepening from coral to rock. 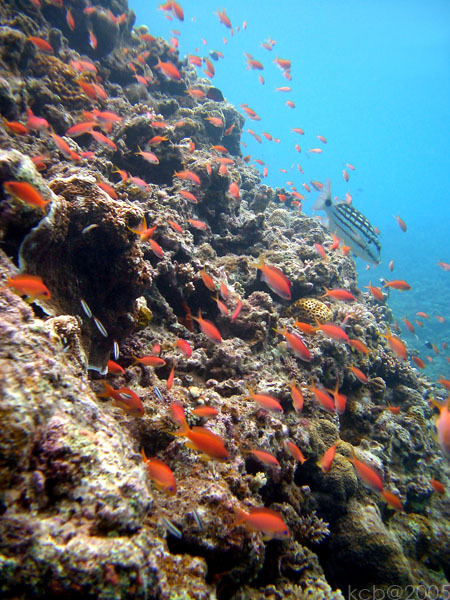 The site is named for the anthias (hanagoi ) marked with square patches on their sides found in the area. Other anthias were numerous as well, including the orange anthias in this picture, along with a patterned grouper (hata). We also saw huge fans (isobana) bigger than me, featherstars (hana umishida), scorpion fish (onikasago) and a number of umi ushi. This site was “Ritoru sando paradise” or Little sand paradise. 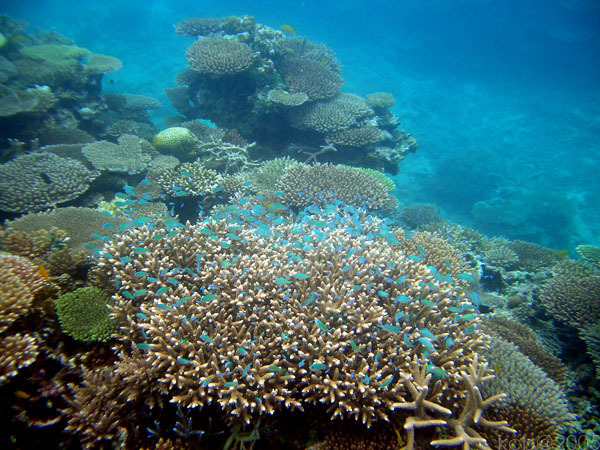 Small islands of rock and coral were scattered about white sand sea floor. This particular rock had red, white and blue schools swirling around it, with several anemones (kumanonu) supplying their own fish. We also saw the well camouflaged leaf fish (hadakata okoze) which I hadn’t seen before. Our last day of diving was at “Midoru hon” or Middle book. This was another site with islands of coral on the white sand. This particular island was a castle about 20’ tall with huge schools of small fish. We saw more groupers, shrimps, stone fish (onedaruma shoze) and the juvenile emperor angelfish with alternating colors of blue bulls-eyes on his blue field. We also saw the biggest helmet shell I’ve seen outside a shell shop – alive! First dive in Belize, at Shark Canyon, Ambergris Caye. 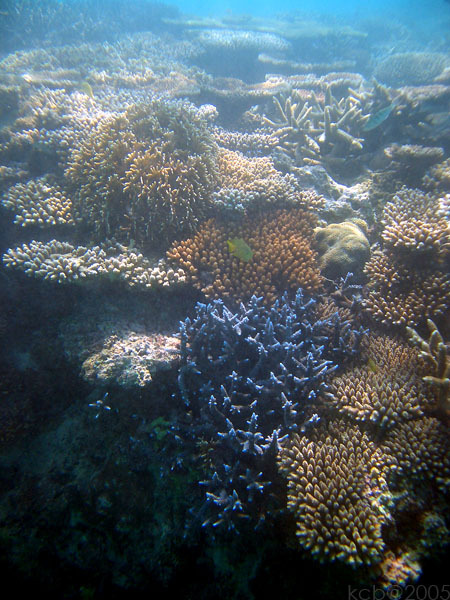 Gorgeous, waving soft coral forest as seen in all our dives here. 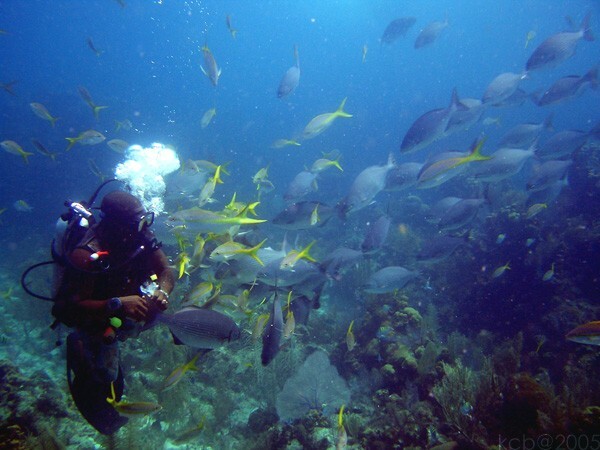 This is part of the Belize barrier reef, the longest in the northern hemisphere and second longest in the world. Eagle Ray Aquarium, Half Moon Caye, following our dive in the Blue Hole. Ball o’ fish was created by one of the divemasters spreading food in the water. This Caye is one of Belize’s atolls. 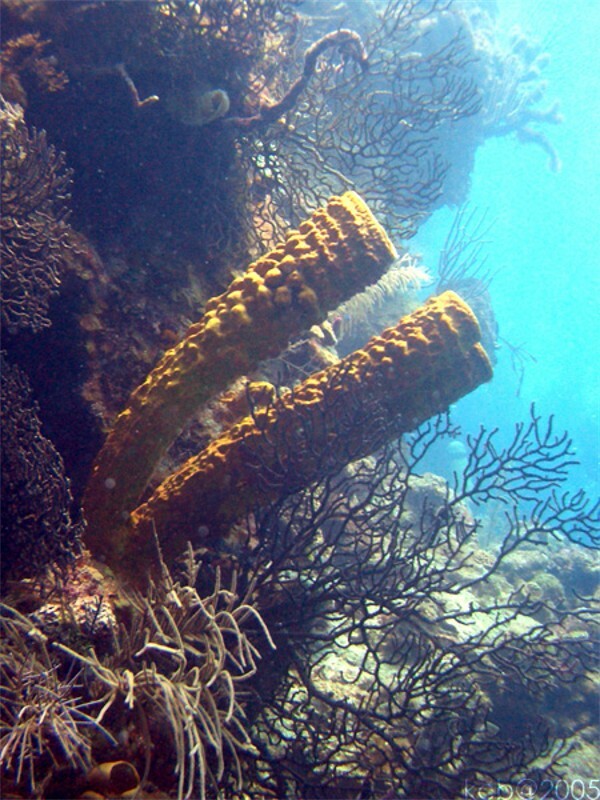 Tall sponges grew everywhere, but especially at Half Moon Caye. Often, small creatures hid inside. 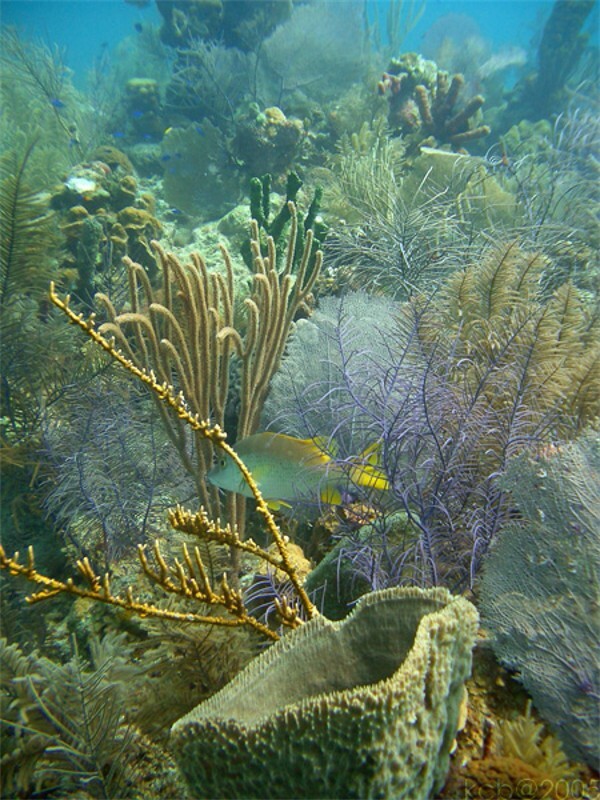 Coral forest wonderland at Half Moon Caye. 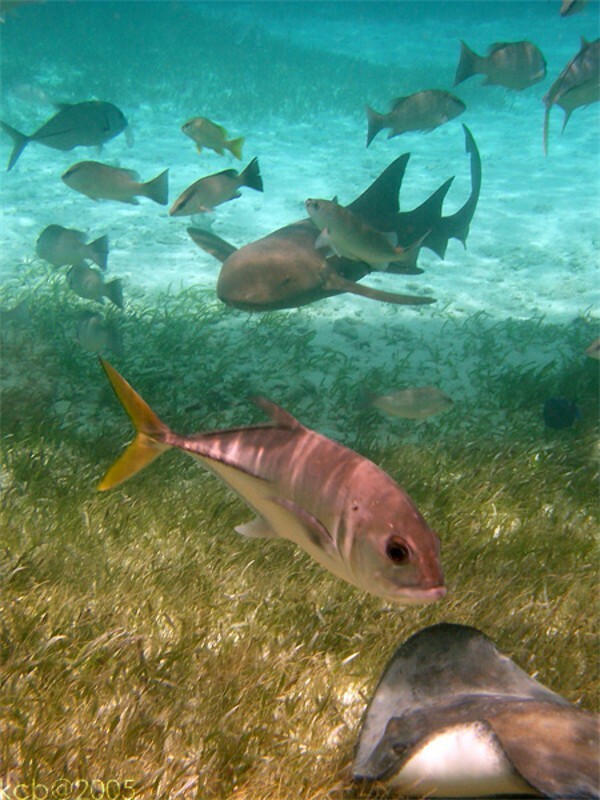 Boca del Rio on Ambergris Caye. This elder statesman swam up to our group of divers and thoroughly inspected us one by one. Then he torpedoed into the blue. Boca del Rio. This younger guy munched contentedly, not paying much attention to us. We hung out, took pictures and then left him still snacking. Blue head wrasse trail the turtle. 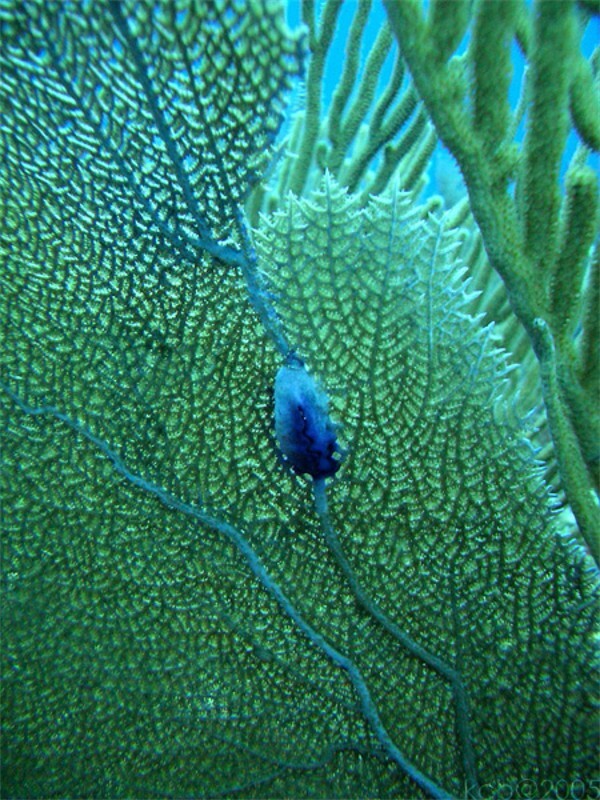 We saw these distinctive fish every dive. 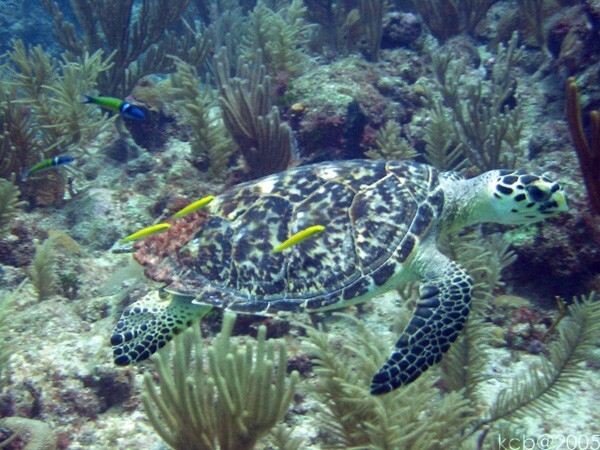 Some of the turtles ignored us, some zoomed away as fast as they could – and they can zoom when they want to! 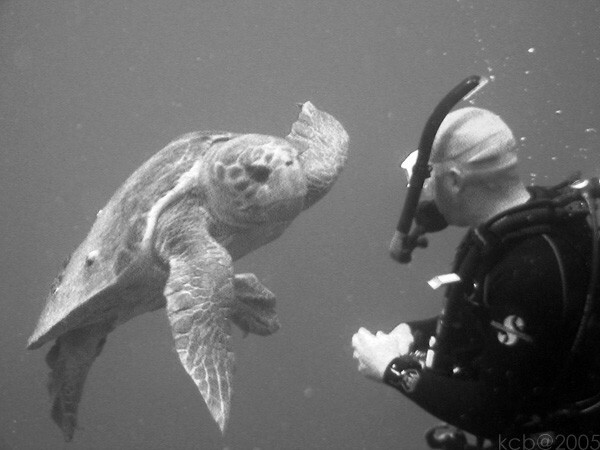 It was apparent some turtles had previous negative experiences with divers, like being grabbed. Our last day of diving in Belize started at Hol Chan Canyon, a protected preserve. The game wardens check for dive boats stopped in the park, charging the dive operators according to their filed diver logs. Our divemaster was complaining about the cost, but it was less than $10 – I think we can afford that! We saw lots of fish everywhere, but here especially. Schools of needle fish congregated in the shallow snorkel spot for during our surface interval. Hol Chan Canyon. 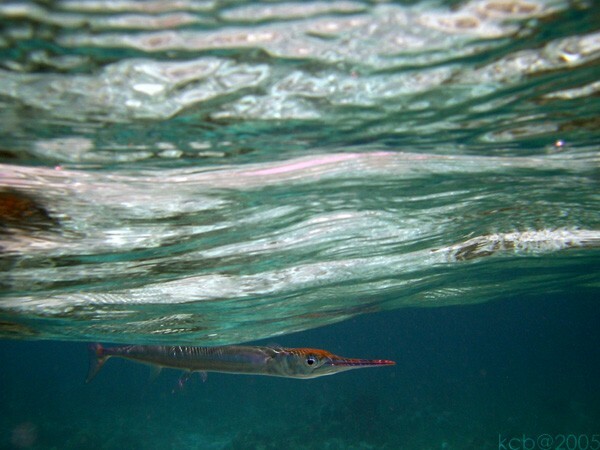 This was in a very shallow area (less than 10 feet) and numerous fish were cruising about like it was their highway. Last dive in Belize, at Amigo Wreck, Ambergris Caye. A “carpet” of squid shimmered into view during our safety stop. I had to drop down for a photo and start my time over.